Alfred and Harold Hinde were two brothers from Lancaster who died during the war. There is no record of their older brother, Robert, of having served in the war. Alfred had worked at the White Cross Mills and had been at the front for about sixteen months at the time of his death. In his obituary, it was reported that Alfred was known as the ‘lucky man of the battalion’, a result of him having escaped any previous injury. In the photograph published with his obituary, Alfred Hinde sported a black button, a symbol of having lost someone dear to him. Records suggest that Harold had been given to an aunty to be raised, due to the large size of the Hinde family. Harold left his possessions to his adopted family. This explains why the obituaries don’t mention the other son, and also explains why he enlisted at a different location and had a different address. Research on the Hinde brothers was carried out now and then, and was difficult as family never talked about the war or its impact on the family. 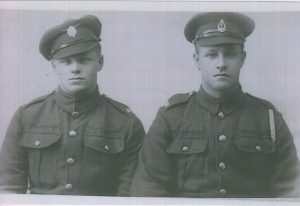 Lancaster Military Heritage Group have more information on both Alfred Hinde and Harold Hinde. The two are not identified as brothers in their research.